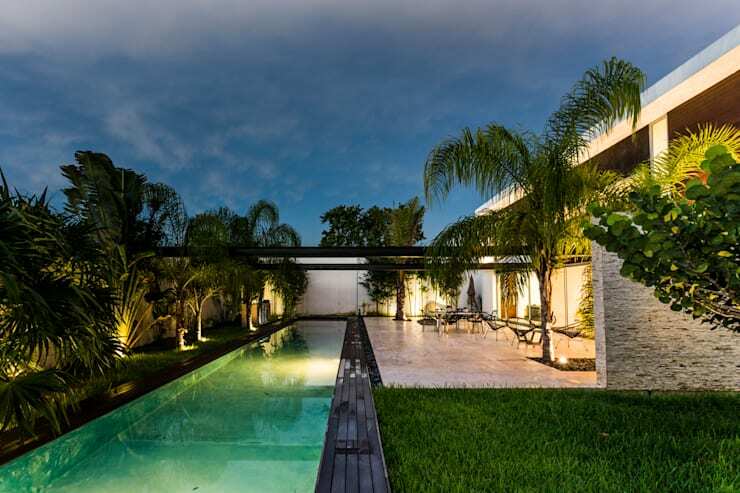 Today on homify 360°, we set foot in Merida, Mexico, where an ultra glamorous house is just waiting to be explored. And what makes this abode so spectacular, you ask? 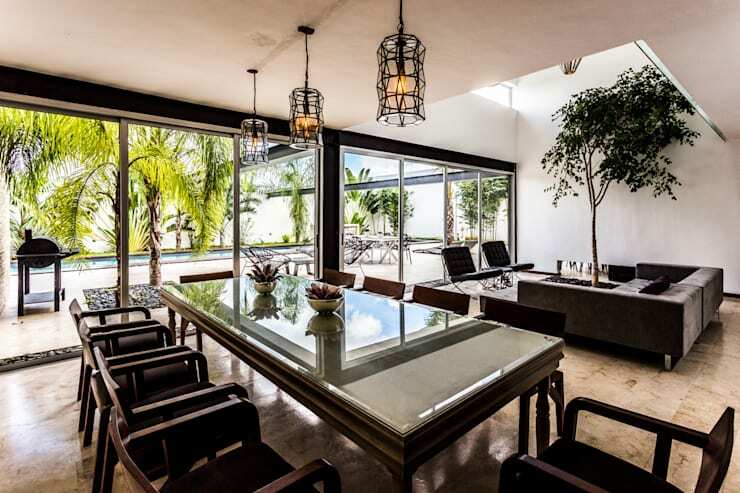 Well, it presents all the right features for a lavish and relaxing time: open spaces (the house is about 420 m²), elegant furniture (think plush sofas and exquisitely crafted kitchen spaces), sophisticated materials (we’re talking stone, wood, marble, tile, etc.) and clean-cut surfaces. It is clear that both architects and interior designers had a ball conjuring up this dream home! 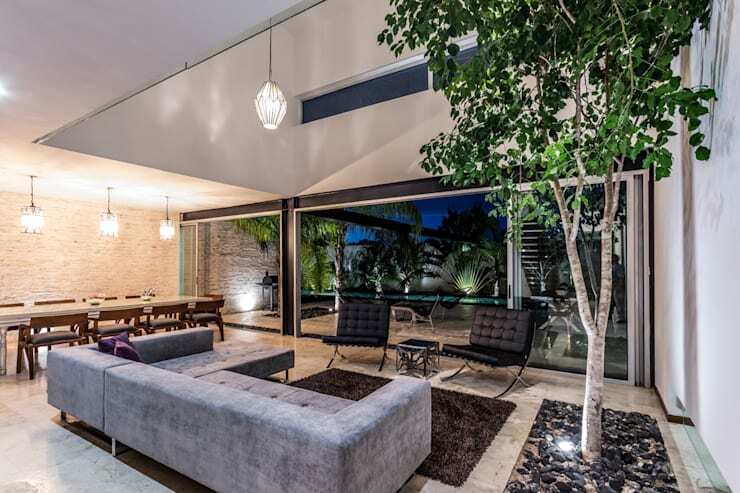 In addition to a strong dose of beauty, the house also very creatively links up the well-dressed interiors with the fantastic exterior settings, seeing as this modern beauty was designed with entertaining and socialising in mind. 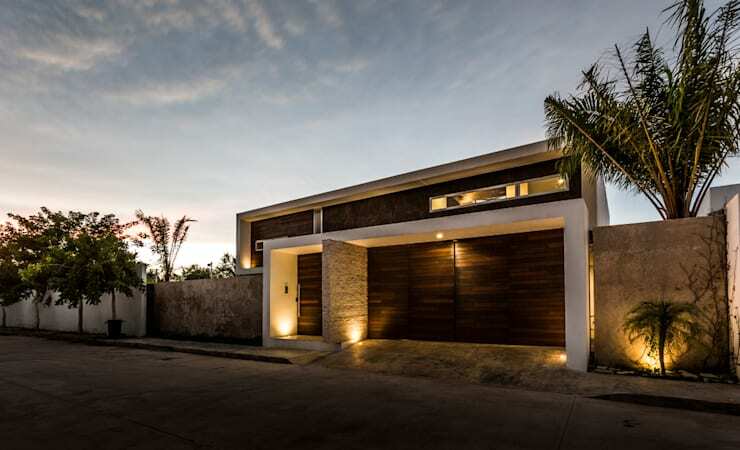 How elegant is this front side of the house, with the golden exterior lights softly illuminating the raw and textured surfaces of wood and stone? Even though a security wall closes off the majority of the house from the street, we still get a fabulous glimpse of the top part. Plus, that front surface with timber panelling and concrete surfaces is certainly nothing to scoff at! We’re inside, and we’re already in love with this house! A foyer with double-volume height adds an abundance of space to the house, made all the more airy and elegant by the light neutral tones. 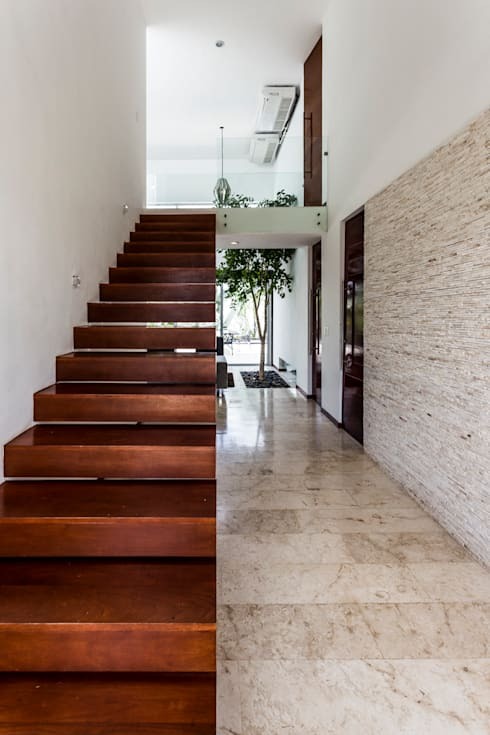 A timber staircase flaunts its fantastic appearance on the one side, contrasting most deliciously with the surrounding colours and materials as it transports us upstairs. And here we are greeted by the lovely open-plan socialising area, which includes the living room and dining room. 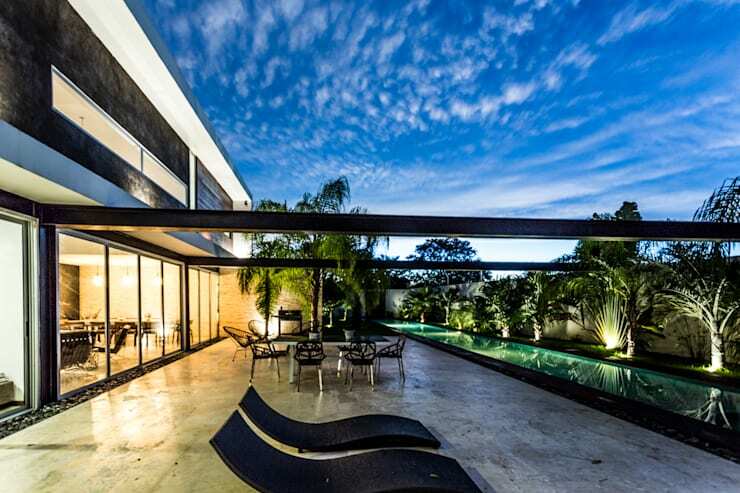 Notice the generous glass doors that slide open to reveal the fabulous terrace pool outside. But back to the interiors, which flaunt an eye-catching colour spectrum consisting of dusty neutrals and earthy hues, offset here and there by a dark and daring tone. However, the mood is anything but dark, for layered lighting provides a dazzling ambience perfect for some night-time socialising. Now this is how you throw a dinner party – or at least where. A modern table clad in dark wood with a glass top provides ample space for 10 diners. 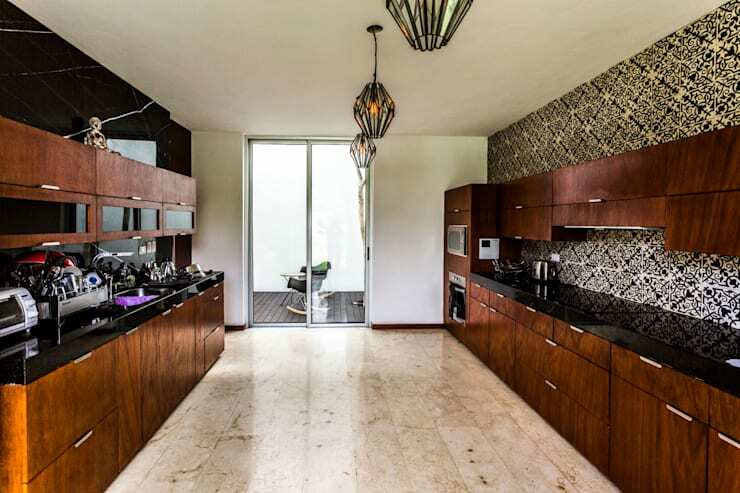 Eye-catching lighting fixtures dangle from above, while a generous dose of sunshine flows inside via the glass doors. Wood takes centre stage in the kitchen, which is styled up to perfection for anybody who takes the art of cooking seriously. Adorning the multiple cabinets with sublime style, the wood contrasts most effectively with the creamy stone flooring, as well as the patterned wall and backsplash. It would seem the main theme of this house is ‘comfort and elegance’, for this look continues successfully outside as well. Here is where a spacious terrace (the one adjoining the living- and dining room) presents ample space for relaxation, dining, entertaining and socialising. And don’t overlook the elongated pool on the side; the perfect spot for cooling off and practicing laps. We couldn’t say goodbye without taking one last look at this glorious backyard paradise. From this angle, we get a better view of the pool, as well as the lawn and garden which are both trimmed and maintained to perfection. We would like to vote for this stylish terrace as the pool-party venue while the summer holiday is still in effect! To cool off in style, we invite you to: Dive Into These 10 Stunning Swimming Pools.